These are definitely heavy duty, safe boots which have superb traction and provide stability to the feet and ankles. Heat resistant, compliant to the safety standards, these boots are perfect for wildland firefighting. Just make sure you order half a size smaller, as they run half a size too big. These Italian made boots are made for forest workers, but are great for lineman and wildland firefighters as well. They are heat resistant, water resistant, with breathable lining and excellent stability. These boots are perfect for wildland firefighters because they are heat resistant, the laces are fire resistant, they have excellent traction, durability and sturdiness. They do run a little small, so make sure you order a size up if you are ordering them online. These boots will keep the feet protected from fire, cuts, water and from falling objects. 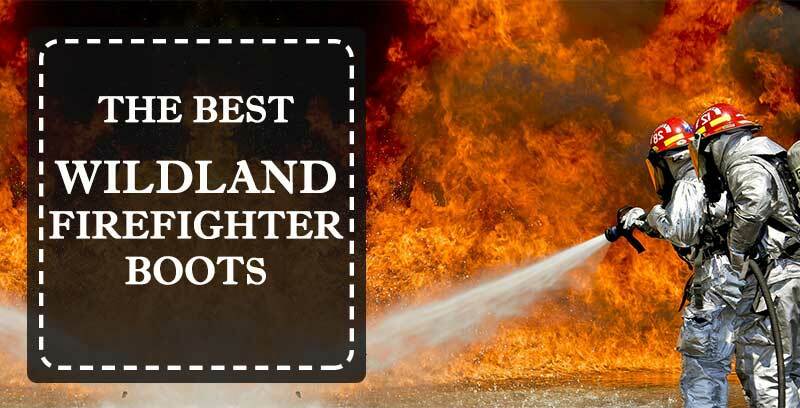 They are made of very high quality materials, have an excellent strong construction and are definitely highly recommended for wildland firefighters. If you are a wildland firefighter and you want lighter and more flexible, yet safe boots, this is the pair you should try on. They are tough, fire resistant, slip resistant, stable and durable. These logger boots are tough, durable, water resistant and with safety toe protection. They are comfortable, made of high quality materials and with a very durable welt construction. COMFORT: Whether you are fighting a fire, or walking around the wildlands, you need to feel comfortable and not have to deal with sore feet. This means, you should look for boots which offer sufficient cushioning, arch and foot support, as well as boots which are breathable and have moisture wicking lining to avoid your feet being sweaty and wet. HIGH-QUALITY MATERIALS: Remember, the higher the quality of the materials and the construction of the boots, the more durable they are. Buying durable boots is a long term investment, because good boots can serve you for years. WATERPROOFNESS: Even though it is fires you will be fighting, your boots should be waterproof, in order to keep your feet from getting soaked in bad weather, wet terrains and while tackling a fire. SLIP-RESISTANT: A strong, slip resistant and heat resistant outsole, so that you avoid injuring yourself seriously after slipping. CERTIFIED BOOTS: It is advisable that you pick boots which are certified for compliance with the firefighting protective footwear standards of the US.